Breakfast is often called the most important meal of the day. It sets you up for the day ahead – eating great food in the morning should be relished. So it’s time to hurl that toast out the window, smash that cereal to pieces and start the day right, Japan style. Millions of Japanese start everyday with a nutrient rich miso soup and a steaming bowl of Japanese rice. Our healthy Japanese breakfast elaborates on these essentials. It’s filling, packed with nutrients and vitamins and easy to prepare. Unlike sugary brekkys, it will release energy gradually, steering you away from the horror of a mid-morning sugar crash and keeping you full up till lunch. Why not try eating Japanese style breakfast for a month and see how you feel? Our healthy Japanese breakfast not challenging enough to your palette? How about taking on our brand new recipe for a natto rice bowl? Slimy, fermented soy beans with a powerful aroma sit atop a bowl of rice. 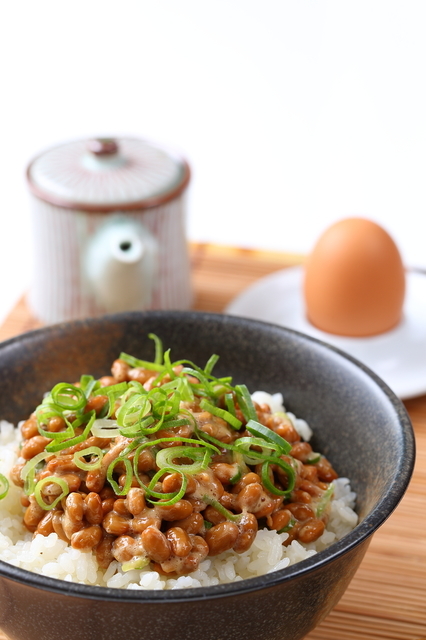 Natto is adored by many Japanese, especially as an addition to brekky. The health benefits of natto are off the charts too. It contains a unique substance called nattokinase, which may help reduce blood clots and generally encourages rude health. You can find out more about natto in our previous blog post on this bean that Japanese wonderfully describe as “neba neba” – slimey slimey. It’s the New Year and the New You, so why not try something new? Eat more natto! Shirataki is the miracle food that’s on everyone’s lips in 2015. This ultra low calorie, zero carb, high in fibre super-food is made from konjac yam. Shirataki noodles are almost tasteless, but with a little magic dressing and some fresh veg they can absolutely come alive and make a vibrant, guilt-free lunch. Try our brand new recipe for Shirataki & Fresh Vegetable Salad and discover the wonder of shirataki. We all get a little peckish don’t we? Resist the urge to chomp on calorific choccys and biccys, or resort to literally pecking around on the ground like a chicken – instead try snacking on some Japanese favourites. Edamame of course, is the undisputed king of healthy snacks. It’s high in fibre, can aid weight loss and is packed with manganese which is essential for maintaining healthy bones, not to mention tasty and moreish. In fact, we love edamame so much, we’ve devised our own recipe for Sesame Coated Edamame that combines some essential Japanese flavours for the ultimate healthy snack. 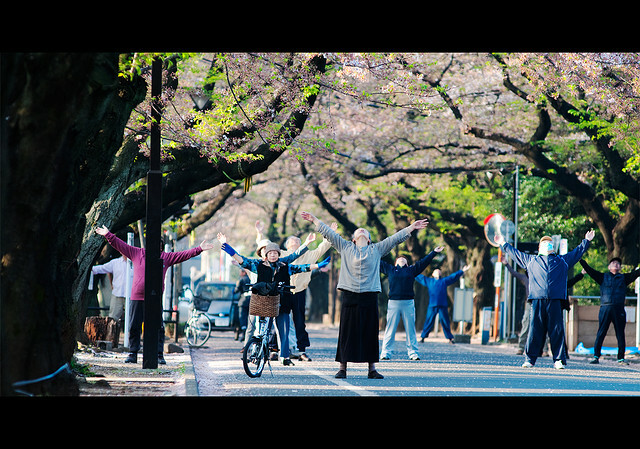 All over Japan, millions of people partake in Radio Taiso group exercises to keep them fitter than fiddles. We’ve taken a look into this extraordinary Japanese practice in our new blog post. Check it out and who knows, maybe you’ll find yourself jumping in to the #RadioTaisoChallenge. One surefire way to diet right is to avoid filling your cupboards with calorific crisps, sugary snacks or any other tempting treats that do nothing for your overall health. Instead, make sure you have the healthiest ingredients in your home. 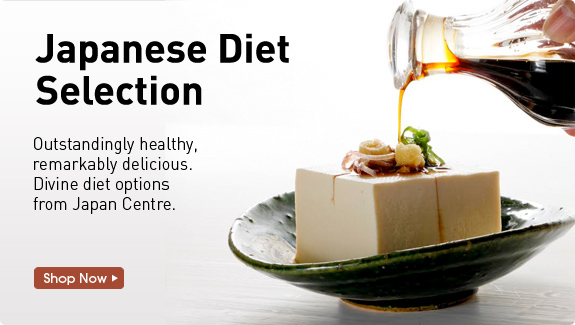 We’ve created a Japanese Diet Selection with some of our super healthy Japanese options that will inspire you to create delicious dishes where you wont pile on the pounds. Browse our selection and get the finest Japanese diet food delivered to your door. Posted in Food and tagged detox, Diet, Japanese breakfast, Japanese detox, Japanese diet, Japanese Diet Selection, konjac, Miso Soup, natto, radio taiso, rice, Shirataki. Bookmark the permalink.